Thinking about spending the holidays in the Caribbean? 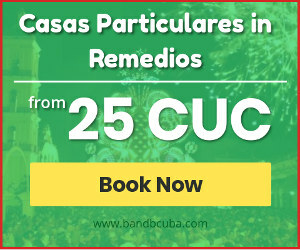 In Bed and Breakfast in Cuba www.bandbcuba.com we will tell you about the Parrandas Festival of Remedios, the celebration of Christmas Eve in Cuba. A celebration you do not want to miss if you are going in December to the island. Parranda is a Spanish word for a street party, with musicians singing and playing their instruments. It´s date from 18th century. This parties usually take place in Cuba and Puerto Rico. 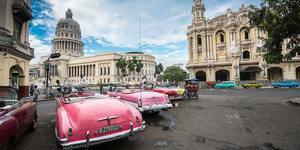 In Cuba, they are famous in Villa Clara, Sancti-Spiritus, and Ciego de Avila. The most famous ones take place in Remedios, this is a colonial city. At the beginning, there were parties in the streets, fireworks, and float circa. The festival evolved, and in the 19th century they started to include the rumba music and verses. This party is in a competition mood but in a very friendly environment. The modern parrandas have had some changes since the beginning of this party. Know you can find in the streets vendors and diverse kinds of activities on the side of the street. 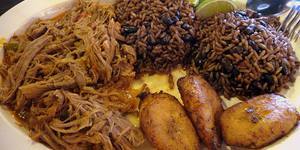 You will be able to enjoy food like candies, the sandwich with pork or ham, pizza... but also traditional Cuban food like rice with pork and yucca. In the parrandas, you will find handmade toys and traditional crafts. You will see traditional fair attractions like wheels, carousels, dragon boats, and more. As we said before, the parrandas take place in different towns, and this means that every town has some different traditions from others. But, in general, they have a structure of events, based on the traditions. Some people tend to confuse the carnivals with the parrandas. In fact, they are similar, but the main difference is that in the parrandas they are two districts participating in the competition. And in the carnivals, there are as many as possible. San Juan de Los Remedios, known as Remedios is a small city in the northeast of the Central Province of Cilla Clara. It is located around 10 kilometers inland, it is in the northern part of the island. It´s at a distance of one-hour drive to the east from Santa Clara. It was founded in 1578, and it is considered one of the oldest towns in Cuba. If you decide to go there on your next trip to Cuba, we recommend you stay in Casas Particulares In Remedios. It´s the best opportunity to save money and get in touch with the locals. This town is not on the main tourist route in Cuba, so this makes it a very charming place to go. Remedios has two churches on its main square, that is not usual in the Cuban´s towns. The city center was declared as a National Historic Monument in 1980. In Remedios, you can still see colonial Spanish architecture. Also, this town is a good place as a base of operations for scuba diving and snorkeling. There, you will find also great beaches, like the famous Las Coloradas, Playa Larfa, and El Paseo. 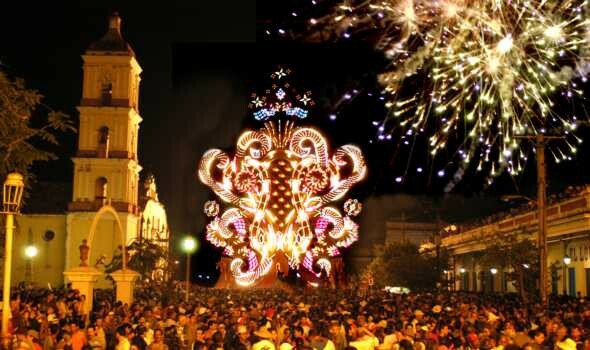 We are going to give you all the information about the Parrandas Festival of Remedios, or the Parrandas de Remedios. This celebration is between December 16th and 25th and take place in San Juan de Los Remedios, this is the eight-village founded by the Spanish people. The Parranda is the oldest celebration in Cuba. The history goes back to the priest Francisco Vigil de Quiñones, who back in the 19th century was concerned about the lack of enthusiasm of the residents of the village for the celebration of the Nativity of the Child Jesus and the attendance to the Christmas mass at midnight. So, he decided to group children in the village so that, armed with bells, trumpets, drums, plates, cans and whatever noisy object there was, encouraged the parishioners to take part in the Misa del Gallo. We can say that was what began as a call for citizen participation in a religious festival, ended up being a party that lasts until today. San Salvador neighborhood’s: Buenviaje, Camacho, Laguna and San Salvador. El Carmen neighborhood’s: El Carmen, El Cristo, La Bermeja and La Parroquia. The competition is for the awards of best float and best work Plaza. Each one has it's owned characteristics, for example, El Carmen used brown colors and a hawk. Meanwhile, San Salvador, has its own figure, the rooster, and blue as its color. 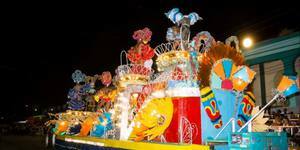 Each carroza or float will be a representation of a history or theme, with its own decoration. The preparation of these is a secret, and they do this all year long. It´s a very serious competition, but also friendly. This celebration is known all over the world as a luxury party and socio-cultural presence. They were "suspended" in 2016 due to the mourning of the death of the president of Cuba, Fidel Castro. But at the end, its postponement was achieved for the first days of January of 2017. There is a Museum of Parrandas Remedianas. Created with the intention to preserve a cultural phenomenon that is unique in Cuba. There you can see a collection of models, photos, and works of the past years. Every year the remedian's are looking forward to this date, and they assume as a duty to work and take part in this parties. The apotheosis arrives on the last day when the competition of decorated chariots, fireworks and jobs takes place. This party starts at 5 pm and the celebration does not end until dawn. 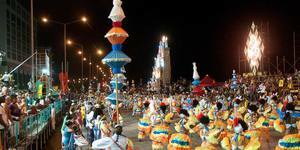 The Parrandas Festival of Remedios was declared in 2013 cultural heritage of Cuba. It´s a big tourist attraction, to this celebration goes people from all over Cuba and from different countries. The celebration starts with the ringing of the Bells of the Parochial Major announcing the beginning of the celebration. In the 24th of December, going to this festival represents the best opportunity to enjoy the Christmas Eve in a unique way. As we say the church´s bells announce the beginning of the celebration. Then, around 10:00 pm, the first groups start its “rumba” with a “Palenque”. Thess fireworks are designed to be almost silent while they are in the sky. So, you won´t hear them with all the noise of the party. This means that people on the parranda are taken by surprise for the fireworks. This means the beginning of the party; the member of the group has the purpose to drag as many dancers as they can while they do their polka. Once this end, the next group starts to do the same and this goes over and over until the next event. The next event of the evening is the lighting of the Plaza. And also, you will see the floats or carrozas, these are big structures, with lots of colors, light bulbs and décor, hauled by a tractor. Each year they have different themes and characters. At the end of the event, you will see more fireworks that illuminate the sky. When this end, the “mortars” starts, this is very loud, the sound of a canon. This is the basic structure of the Parranda, but there is so much more to see there. The vendors, the food, everything will amaze you. It´s a festival you do not want to miss if you go in December to Cuba. Some people will recommend you not bring your camera or valuables to the Parrandas. But, if you want to take it with you it´s up to you to take care of it. You will see that Cuba is safe for travelers. It is better to left your big bags in your accommodation. It will be uncomfortable hanging around with something to carry on. This celebration is like any big street party around the world, but with alcohol includes. If it is possible to bring small bills, it will be easier to buy drinks and food. There, as in any other informal shops of the island, you can bargain with the vendors. You can negotiate. It is better to book your accommodation ahead. Because these are very busy days in Remedios. You can contact us to book a casa particular in Remedios. Go there with the determination and have the security that you will have fun. Explore the streets and merge with the locals. 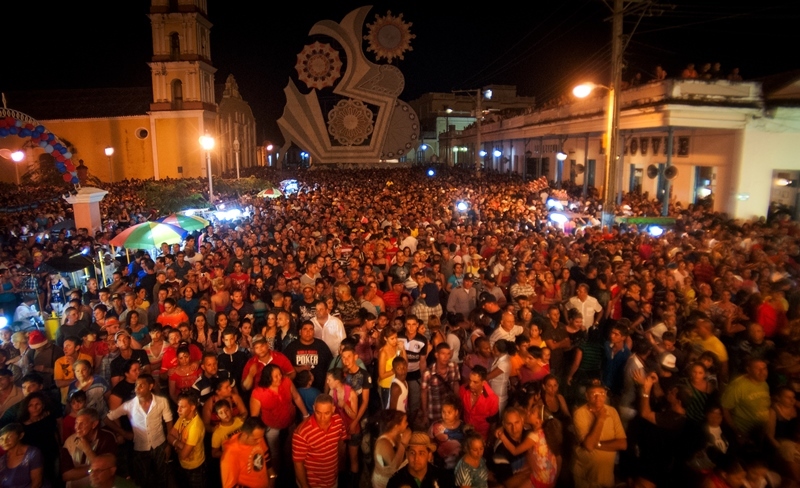 If you want to celebrate in a unique way the nativity of baby Jesus, the Parrandas Festival of Remedios are the best way to spend the Christmas Eve in Cuba. Did you know about this celebration? What do you think about this kind of parties?